What is a hard-nosed person like? Rob thinks he's found the perfect person to fit the description, but when he tells her, she's not impressed. 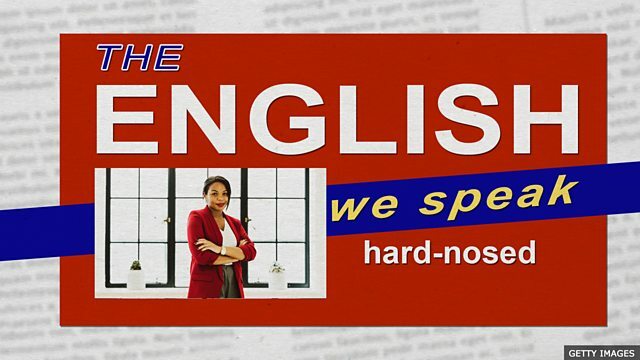 Find out what a hard-nosed person is really like in this episode of The English We Speak. Hello, welcome to The English We Speak, with me, Feifei. And me, Rob. Now Feifei, would you call yourself hard-nosed? Oh here we go again – you're trying to insult me. Can we leave my nose out of the conversation please? I was starting to compliment you. Go on… why is having a hard nose a compliment? …someone who is determined and tough-minded. That's you, isn't it? Hmmm maybe. Well, yes I suppose that could describe me. I thought so. Let's hear some more examples of this word 'hard-nosed'…. She's a hard-nosed reporter - she got the scoop that none of the other TV channels managed to get. When my son was ill I asked my boss for time off but he's so hard-nosed he said 'no'! Our company is in financial trouble, we need a hard-nosed business person to come in and save us from closing. I've been researching this word and understand that being hard-nosed also describes someone who is stubborn, unforgiving and insensitive! Erm, Rob, can we talk about this please? I was trying to be nice! I don't care. I will not forgive you. What about if I called you soft-nosed? No. From now on I'm only going to present with Neil. Now, I've got a pile of work to do so I'm off to write some scripts. There you go – hard-nosed – practical, determined, stubborn and unforgiving.